ORIE Peanuts are made with love. They are naturally wholesome and slowly roasted in batches to a smoky, crunchy perfection! With only a hint of salt and incorporating techniques from West Africa that enhances the taste of our peanuts, giving them a unique robust smoky flavor that’s simply irresistible and will keep you digging for more. 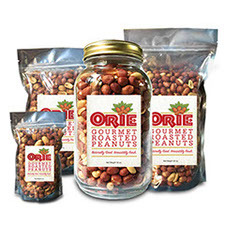 ORIE Peanuts are carefully sourced from local farmers in Georgia and proudly made in the United States of America. Along with offering a taste of Africa in every bite, every purchase of ORIE Peanuts proffer hope of a more promising future to girls in Africa by supporting their education and providing them with personal hygiene needs. Enjoy the unique taste of ORIE Peanuts and make a difference in the world! 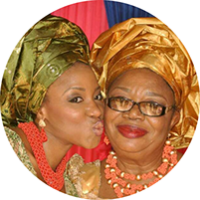 Relocating to the United States in 1999, Nina soon learnt that none of the various brands of peanuts in US had “that” taste and so would always ask friends and family visiting from Africa to bring her groundnuts. Her mom also never missed an opportunity do same along with cooking spices and other hearty goodies. After several trial and error, Nina was able to finally source the right type of peanut and perfected the technique to recreate that unique, unadulterated and wholesome flavor of roasted peanuts that she craved. She knew she was on to something good when family and friends who tasted her homemade roasted peanuts fell in love with its special smoky taste, crunchiness and freshness. With the passing of her mom in October 2015, Nina decided to memorialize her by launching the peanut line and naming it after her – ORIE. A part of the brand’s mission is to share the rich African culture with the world and to give back to the community through the efforts of Young African Girls Organization – YAG Organization, a non-profit organization founded in 2014 with a mission to inspire, promote and empower less privileged African girls. Providing them with basic hygiene needs and educational support to diminish the disparity between girls and boys in African schools. 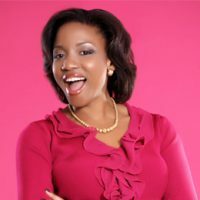 Nina resides in Atlanta, Georgia with her very supportive husband, Kelly and often travels to African countries to consult, speak and provide business trainings to encourage entrepreneurship among youth and women in Africa. It was on one of such trips that her eyes were opened to the need to support young girls in these areas, many of whom do not have access to basic education and sanitary needs. Some are sometimes forced to drop out of school for so many reasons one of which being lack of basic personal hygiene needs. A percentage of every sale of Orie Peanuts go to support this mission and proffer hope of a promising future to girls in these under-developed countries. Copyright 2017 - Orie Foods. All Rights Reserved.